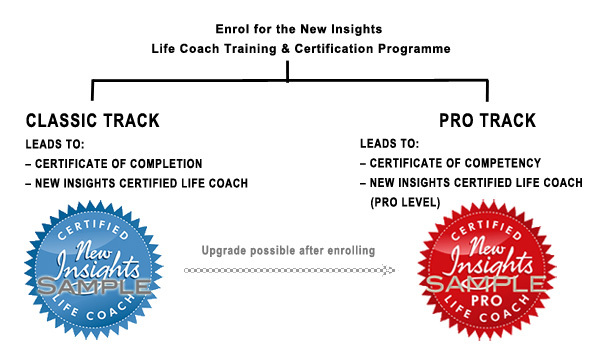 You have a choice of two certification options, or tracks, when you enrol for the New Insights Life Coach Training and Certification Programme. We designed the original (CLASSIC) Life Coach Training and Certification Programme as a home study course to offer the maximum convenience and flexibility. New Insights training is comprehensive and includes everything you need to become a great coach. The Programme is centred around you, the trainee life coach, not around us. So you study and do the practicals in your own time and at your own pace, knowing that there is great support just an email, telephone call or a few mouse clicks away. Having said that, some trainees want to take things a step further and enjoy the added comfort of being coached and mentored by a dedicated, experienced New Insights certified life coach. In 2012 we introduced the PRO certification option, or 'track', to suit the needs of such trainees and to bring in a somewhat more advanced form – or second level – of certification. in what ways are the two options the same? It's important to note that either certification option will give you access to the full suite of New Insights training material, resources and support. And certification at either CLASSIC or PRO level will entitle you to license the New Insights LIfe Coaching System for use in your practice, should you decide to. *In most countries in the world (certainly SA and the UK) life coaching is non-regulated, meaning that there are no statutory requirements governing the practice. You should check this for the country you live in. Pictured above is the certified coach identifier that you will be entitled to use in your emails, website, stationery and marketing material after completing the CLASSIC certification option, or track. CLASSIC, is our most popular certification option. It lacks for nothing when it comes to comprehensive, high quality training at a modest fee. 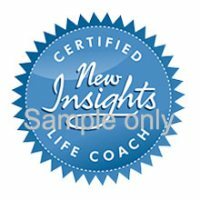 This option will lead to a professional Certificate of Completion and will qualify you to use the designation New Insights Certified Life Coach and our distinctive certified coach identifier on your website and stationery. Your successful completion of the theory element of the programme including the self test assignments and the final exam (with the grade that you achieve). Your successful completion of at least 50 hours of practice coaching generating practice client feedback that is reviewed by New Insights. Your declaration of intent to abide by the New Insights life coaching Code of Ethics. By choosing the CLASSIC option you will have the flexibility to add on the coaching and competency assessment services required to upgrade to our PRO level certification at any time during or after your certification, should you wish to do so. Pictured above is the certified coach identifier that you will be entitled to use in your emails, website, stationery and marketing material after completing the PRO level certification option, or track. The PRO certification option will lead to a professional Certificate of Competency and will qualify you to use the designation New Insights Certified Life Coach (PRO Level) and our distinctive certified coach identifier (PRO level) on your website and stationery. The PRO track builds on the CLASSIC track by including access to personal coaching and mentoring from one of the top New Insights certified coaches. We refer to these partner coaches as VIP (Valued Independent Partner) Coaches. There are a limited number of them and they are all highly trained and experienced. You will be entitled to up to 20 hours of your appointed coach's personal time and this will be spent coaching and mentoring you through the 15-session New Insights Life Coaching System so you get to experience what it is like to be coached with the system while you are learning to coach with it. Your coach will interact with you remotely using Skype, Zoom or similar. Also included in the PRO fee is a comprehensive assessment of your coaching ability. This assessment normally takes at least three hours and is conducted by another VIP coach using video or audio recording of two of your practice sessions as supplied by you. WHICH OPTION WOULD SUIT ME BEST? You want a comprehensive, tried and trusted and highly effective life coach certification programme that really works! You want the flexibility to be able to upgrade to our PRO certification level in the future, should you decide to take your coaching qualification to the next level. You are quite comfortable using the excellent email, telephone and online support that New Insights offers, in the knowledge that it has served hundreds of other trainees perfectly well. (b) You are contemplating this course primarily for your own personal development and will decide later whether you wish to use it to become a practising life coach. You want to enhance your training experience through exposure to the personal supervision of a top New Insights certified VIP coach. You want to experience, first hand, what it is like to be coached using the New Insights coaching system. You want to have your coaching competency assessed, not just through the feedback received from your practice clients, but by an experienced assessor. You are prepared to pay a higher fee to cover the additional services offered. The Complete New Insights Life Coaching System for use in practice coaching. Courier delivery of your programme material – all 10 kg of it – to your door. Responsive and caring certification support from New Insights for up to two years after you enrol. Up to 20 hours of one-on-one coaching and mentoring in the use of the New Insights Coaching System. One professional and objective assessment of your coaching competency based on a recording submitted by you. A professional Certificate of Completion issued on successful completion of all certification requirements. A professional Certificate of Competency issued on successful completion of all certification requirements. Entitled to the designation New Insights certified life coach. 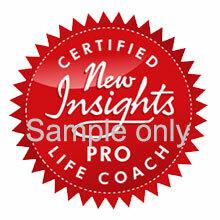 Entitled to the designation New Insights certified life coach (PRO level). Access to a genuine life changing opportunity. Our Programme fees and payment options are available on a separate page which you can access from the menu or by clicking the link below. Please note that if you start with the CLASSIC option and upgrade to PRO at a later stage this will cost you slightly more than starting with the PRO option.